A disabled child became distressed and cried unless constantly rocked during waking hours. Carer has developed repetitive strain injury from keeping existing baby rocker in motion. A windscreen wiper motor with chain drive actuates an arm attached to the rocker seat by plastic cord. The whole is mounted on a base to prevent creep, and can also be attached to child’s pram. Adaptation has seat belt for safety. 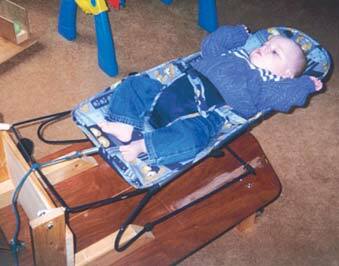 The child can be kept in motion without strain to carers, the child is soothed and parents are less stressed.